Join New York City based artist Max Greis, as you use mixed media (collage, paint, & ink) to create your own illuminated manuscript page of a monstrous scene. Taking inspiration from the exhibition: Medieval Monsters: Terrors, Aliens, Wonders, participants will start by creating a collage as a base and construct their own illuminated page using a variety of materials, including gold leaf and tempera paint, to add detailing to their own imaginative monster, while pen and ink will be used to add typography. Examples of illuminated manuscript typography and patterns will be available. 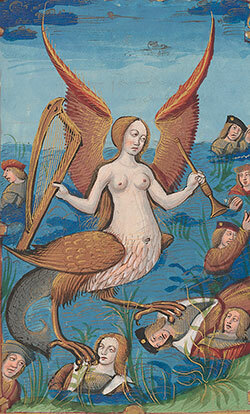 Image Caption: Siren, from Abus du Monde (The Abuses of the World), France, Rouen, ca. 1510. New York, The Morgan Library & Museum, MS M.42, fol. 15r.